Data managers, like the Traverses manager shown here, help you organize your survey data. The Points manager manages the points. The Surface manager manages the surfaces. 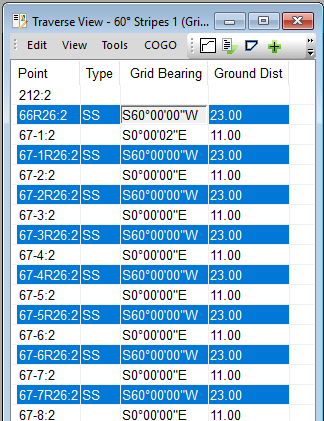 You can format the managers to include information you want quick access to, like the areas, linear error and number of points shown here. Groups allow you to organize large data sets. Put all your parcels into the Parcels group, then open that group to work on parcels. You will spend a lot of time in our Traverse View. This is where you enter most of your data or come to look at the data you just imported. 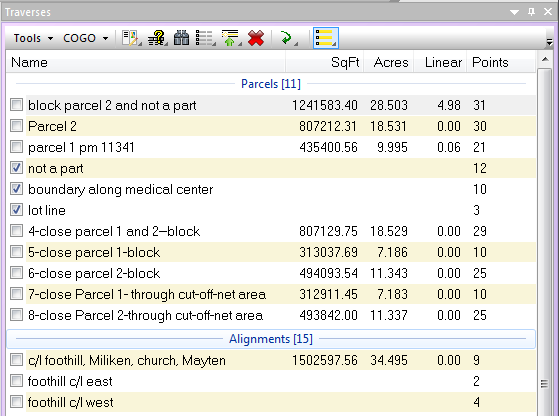 In the traverse shown here, we’ve imported the GLO notes for an entire township using GCDB point labels. All the calls for every tier in the township are here. 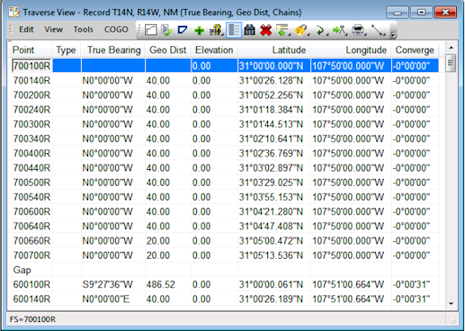 Format the view to display just the data you want, like the True Bearing, Geodetic Distance and chains shown here. Got a lot of data to enter from deeds and surveys you’ve researched? You can enter all the data right right on the keypad, even bearings, so data entry is blazingly fast. Because your data creates your drawings, TPC can synchronize the views, letting you see the data while you enter or edit it. 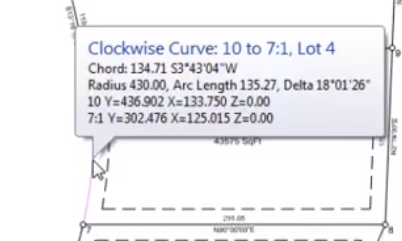 In the example shown here, we’ve computed a COGO intersection of a property line and a right-of-way curve, entered that call into a boundary traverse and now TPC draws that curve in our current drawing. It’s pretty amazing to watch it all happen right before your eyes. Want to see your data in the drawings? Just turn on tooltips (Default = On). TPC gets the information from the survey, not the drawing. So trim a line in the drawing and TPC will still display the untrimmed, survey quality, length of the line. Don’t want tooltips? Just turn them off and TPC still displays survey information on the status bar as you position the cursor over a survey drawing object. In the example here, we’ve selected all the side shots (with one command) and are entering parking stripe direction for all the parking striping by entering just one bearing. You can do the same thing in drawings, by selecting any number of drawing objects, then by moving just one object, they all move. Letting you apply the same operation you apply to one data or drawing object to multiple objects is just one of the reasons you are going to love working with TPC. 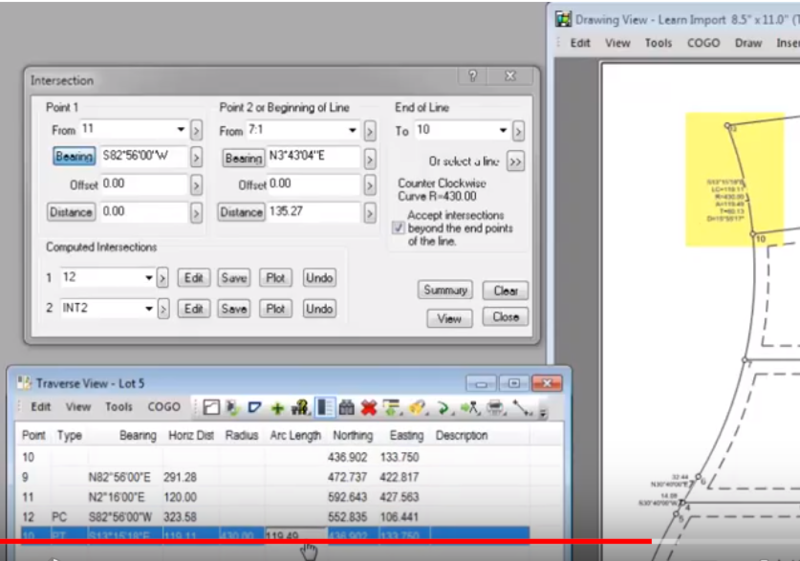 This video introduces you to entering a lot traverse by bearings and distances along with curves. 1:00 Add Lot 5 to the Traverse Manager – use the New Traverse dialog to select the format and settings.